Due to the newly arranged light heavyweight bout for UFC 133, Rashad Evans risks his chance for a title shot against Jon Jones should he lose versus Phil Davis. Due to a torn ligament in his right hand, light heavyweight champion – Jon Jones – was sidelined for up to six months. That said, up and coming prospect, Phil Davis, was tapped to face Rashad Evans at the forthcoming UFC 133. UFC President, Dana White, praised Phil Davis’ decision but did not make any promises for a title shot in case the fighter wins the match. Rashad Evans, on the other hand, definitely risks his standing in the light heavyweight title picture should he come out defeated at UFC 133. However, Dana White said that it is MMA’s harsh reality. 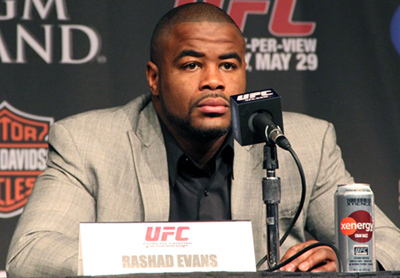 Fortunately, Rashad Evans can still earn his shot back against Jon Jones if he wins at the August 6 event. Regardless, Dana White hopes that the new match-up can prove a lesson to aspiring fighters.